Standing on the beach in Bray today, watching the waves swell up and beat against the pebbles on the shore and the wet patches of sand, I kept on thinking how much we have forgotten about the plight of refugees in the Mediterranean and how still keep on being washed up in large numbers on the shores of Greece. They have only come to the fore once again in Britain in recent days because of the commitment of the murdered MP Jo Cox to the fighting for justice for Syria and Syrians. In some ways the discussions about her attacker and his psychiatric ill-health is a put-down for the many people who need psychiatric care. They live in the community but surely they are no more prone to murderous attacks on politicians than those of us who have physical ailments. The blame for his action must rest squarely on the people who have vile political ideologies and who are happy to use and abuse anyone, whether they are ill or not, to spread their vile. Mental illness does not cause people to commit murder, but a toxic political debate such as this EU referendum can push an unstable person over the edge. Britain First was formed in 2011 by former members of the British National Party (BNP), and has grown rapidly to become the most prominent far-right group in Britain. Britain First builds its online presence by using social media to campaign issues such as animal cruelty, wearing a poppy on Remembrance Day, or showing support for the royal family, and asking people to “like” its messages. So successful has it been that it now has more than 1.4 million “likes” on Facebook, more than any other British political party. The group has carried out mosque invasions and so-called “Christian patrols.” In a march in January in Dewsbury, near Jo Cox’s Batley and Spen constituency, 120 Britain First members carried crucifixes and Union Jacks through the town. What is the difference between Britain First and UKIP? Their policies are the same, their bombastic rhetoric is the same, and they appeal to the same group of voters. Does that mean violence is already the next step in Farage’s campaign? What if he loses the referendum next week? Trying to separate the politics and actions of UKIP and Britain First seems to be as facile as trying to separate the IRA and Sinn Fein. 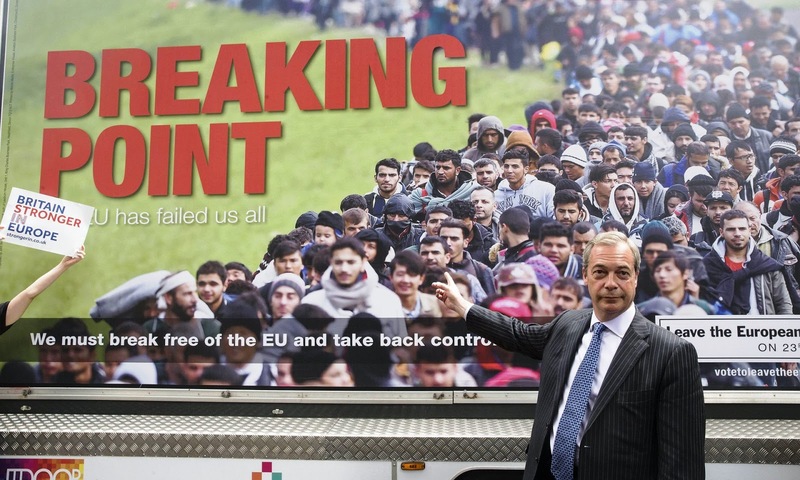 An anti-migrant poster unveiled this week by the UKIP leader Nigel Farage has been reported to the police with a complaint that it incites racial hatred and breaches British race laws. So Britain First campaigns on the slogan “Britain is full up,” and UKIP campaigns on the slogan “Breaking point.” An MP is dead, more hatred is generated, while this discussed the “Leave” campaign generates support on the backs of suffering refugees and migrants. Last week, Boris Johnson was happy to share a platform with UKIP’s only MP, Douglas Carswell. Twitter users have pointed out the poster’s similarity to Nazi propaganda footage of migrants shown in a BBC documentary from 2005. The photograph Farage used this week is one of migrants – mainly Syrian refugees – crossing the Croatia-Slovenia border last year, and was taken in Slovenia by a Getty Images staff photographer Jeff Mitchell. The only prominent white person in the photograph obscured by a box of text. The rising, sickening attitude to refugees and migrants is seen in the disgusting way some England and Wales fans mocked and jeered refugee children in French streets this week, chanting and throwing small coins at them. These men see nothing contradictory in the fact that they are supporting their countries in a European competition. In France, they are as much foreigners as the children they are jeering. Yet, when they come home, presumably these men will vote as UKIP directs them or join in Britain First marches. Last month, the Archbishop of Canterbury, Justin Welby, said Nigel Farage is guilty of “inexcusable pandering to people’s worries and prejudices, that is, giving legitimisation to racism.” This needs to be repeated over and over again. I spent a sunny, summer afternoon last week walking around the small village of Comberford and through the green and golden fields and countryside of south-east Staffordshire, between the A513 and the banks of the River Tame. It is an area I have known since my late teens in the late 1960s and early 1970s, and it has long been associated with my family name and history. Comberford is a small village in a pleasant rural area, about 8 km (five miles) east of Lichfield and about 4 km (2.5 miles) north of Tamworth, between the A513 road and the banks of the River Tame. Historically, Comberford is part of the parish of Wigginton, and it is now within the Wigginton and Hopwas civil parish in the district of Lichfield. The local authority is Lichfield District Council, with offices at District Council House, Frog Lane, Lichfield, Staffordshire, WS13 6AA. The surrounding area is dominated by farmland except for Hopwas Wood, an ancient woodland, and the area has a strong sense of identity. Comberford is a small community of 21 homes, isolated by its single access from the A513 with limited development opportunities and therefore not subjected to development pressures. However, local plans recognise that the setting and the open character of Comberford are important to preserve. The name Comberford derives from the Anglo-Saxon and means ‘river crossing in the hollow’ or in ‘the valley.’ However, Bardsley says a “comb” was a cell or hollow in a hillside, where there was a sheltered habitation. The Celtic word cwm means a hollow, while the Anglo-Saxon camb means the crest of a hill. There is archaeological evidence of settlement in the area that predates Anglo-Saxon times, going back to perhaps Roman times. 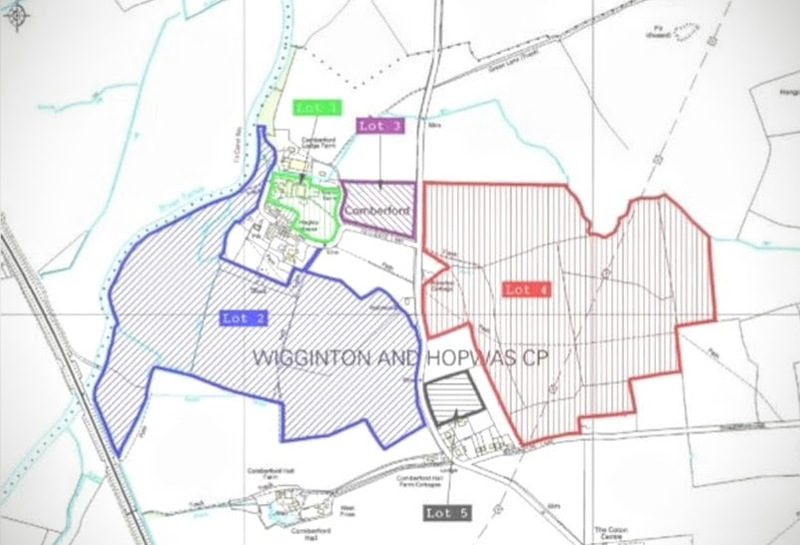 The earthwork remains of ‘shifted villages’ around Comberford, particularly to the south, and to the north-east of Wigginton are among the archaeological sites recorded within the Staffordshire Historic Environment Record (HER). These features suggest that both of the villages of Comberford and Wigginton were either once larger or have shifted away from an earlier focus, which then remains as earthworks in the fields. These remains form an important part of Comberford and retain a high potential for below-ground archaeological remains to survive. 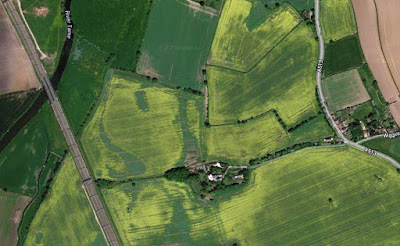 Other evidence, surviving as cropmarks visible on aerial photography in areas now being ploughed, includes possible prehistoric-Roman enclosures and settlement in the wider landscape around Comberford. Further undated enclosures and cropmark features, mostly to the south of Comberford and Hopwas, may also help to date them to these periods. In all these cases, there is a high potential for below-ground archaeological remains to survive which could contribute to an understanding of how people interacted with and managed the landscape of this area. The presence of these features also raises the potential for further currently unidentified archaeological remains to survive within the parish. Beside Comberford Hall is Comberford Hall Cottage, which is on the market [June 2016] through Northwood of Lichfield Street, Tamworth, with an asking price of £495,000. This is a Grade II Listed house, with four bedrooms. 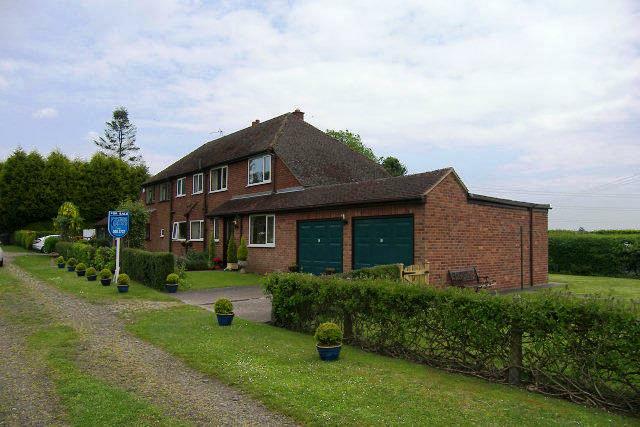 This semi-detached cottage directly adjoins Comberford Hall. However, Comberford Hall Cottage has its own gardens and privacy, and is being sold freehold. In the early 1970s, a ridged indentation in one of the fields to the north of the Comberford Hall close to the right of way that leads to Comberford village, was pointed out to me as the site of the original hall. However, this contradicts Shaw’s descriptions of an original house east of Comberford Hall, and Mrs Coltman’s insights. Instead, it probably matches the crater shape in the field to the left of the path from Comberford village to Comberford Hall which was known to the village children in the 1950s and 1960s as “the bomb field” and caused by a stray war-time bomb. The houses at No 1 and No 2 Hallfields Drive, Comberford, were built in the 1950s as Comberford Hall Farm Cottages by Geoff Hart of Comberford Lodge Farm for farm workers. At the opposite end of Hallfields Drive and the drive leading up to Comberford Hall, Wigginton Lane leads into Comberford Lane and Wigginton Village. The mission room beside the church was used for church and village functions, but ceased to function in the 1970s. But the church continued to be the only public building in the village, and in recent years it was the venue for public and parish council meetings, and special events in the village. In 2006, the Right Revd Jonathan Gledhill, Bishop of Lichfield, preached in the church as part of a Mission Weekend. The church remains closed, right-of-way access has been closed off, and its future is uncertain. There is a number of traditional brick under tile barns, including a standalone barn within the large farmhouse garden. Hagley House is six-bedroom freehold detached house on Manor Lane, and last sold in 1999. The Bowler family lived in Lodge Cottage, later the home of the Bury family. The Benson family lived next door. Tom Hunt, who married Frances Blood, lived at Church House. Mrs Stretton lived at Orchard Cottage on the main road. Although a bus passes by the entrance to Comberford at Toll Gate Lane, transport to and from the village is mostly by private car. As I was reminded again on my walk in Comberford last week, Comberford is seldom disturbed by visitors, and because the village is at the end of a country lane or cul-de-sac, there are few cyclists or walkers. I was alone on my walk, but my solitary pursuit allowed me to appreciate the beauty and tranquility of this little corner of Staffordshire.